Eleanor and Park by Rainbow Rowell. Loved this. I love how Rowell can create such a cozy, inviting world in her books. I want to hang out with her characters and still find myself wondering what they’re up to. This book was about real life, two teens who don't fit in anywhere falling in love and trying to see if they can make it work in high school. The Boy in the Dress by David Walliams. David Walliams is hilarious, and this book is funny and touching. Quick read, highly recommended for middle graders regardless of gender. It's not totally in the realm of transgender issues, more about a boy who likes fashion being teased for that instead of encouraged to explore his passions. I’ll Meet You There by Heather Demetrios. LOVED this book! The characters and setting were so cozy, I wanted to crawl in and never leave. Touching story, well-written without being overly sappy. Skylar is ready to get out of her tiny town and go away to art school, even if that means leaving her mother, a recovering alcoholic, behind. When Josh, an old coworker, comes back from Afghanistan, Skylar starts re-thinking her place in the world, and where she can do the most good. Book Scavenger by Jennifer Chambliss Bergman. If you never read any other book I recommend, please read this one. I love this book SO much, I already want to re-read it. Codes, hidden books, visiting landmarks in an historical city - what’s not to love? Emily has been an active Book Scavenger for years, so she’s excited when her family moves to San Francisco, even though she’s tired of moving once a year. Now she’s in the hometown of the man who created Book Scavenger, and he’s about to release a new game! But when he’s mugged in a subway station, no one knows if the game creator will make it, and Emily is worried her family will move again before she can participate in the game. Harry Potter and the Sorcerer’s Stone by J.K. Rowling. Yes, I’m just now reading Harry Potter for the first time. I tried to read it when it first came out, but it just wasn’t my thing. Also, my reading interests were narrower, and I had less time to read. I also saw the first two movies and wasn’t blown away, so I just figured I’d never read the book. 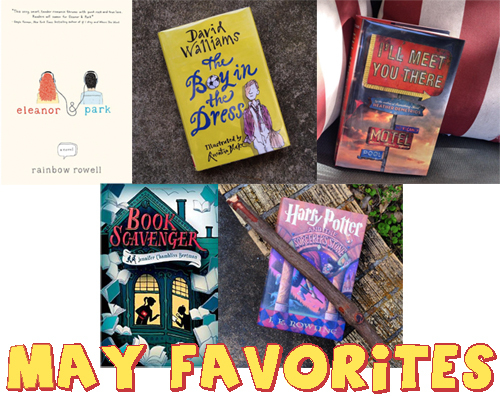 This year’s summer reading theme made me interested in trying, so I started… and I actually love it so far! Much less fantastical than I thought they would be; I like how everything is explained parallel to “normal” life, which keeps it grounded for me. Eager to finish the series.